What are they calling it? An arctic vortex? I don’t know what it is, I’m not a meteorologist, but it’s cold, it’s really cold. And it’s not just here in Delaware. Birmingham, Alabama got snow yesterday! The wind chill is -65 degrees in parts of the midwest. Even New Orleans, Louisiana is opening shelters for the homeless to keep them out of the cold, they call it their Citywide Freeze Plan. Cold, scary times. While Delaware isn’t getting the snow and isn’t currently -50 degrees, it is still wicked cold and our hearts go out to all of our addressless friends who are struggling. In Delaware, when the temperatures are frigid it is called a Code Purple. Essentially what this means is that emergency sanctuary locations will open for the homeless to stay overnight. The locations are typically open from 6 p.m to 6 a.m. and patrons receive a meal for dinner, our 3B bags when they leave and a bus ticket. It’s not enough, but it’s something and it’s currently all we can do. There are not enough shelters to hold all of our homeless. The emergency sanctuary locations are not homeless shelters. So when they open their doors, they are equipped with volunteers offer. The consistently awesome thing about Delawareans is that they are givers. I am humbled each and every day when I drop off 3B bags and see all of the kind people helping others. I am so grateful. If you are unable to volunteer, please consider packing a bag of healthy food, water, chap stick, hand warmers, socks and hats and leaving it in your car. If you see someone in need, then you will have something to give them. Please also consider calling 2-1-1 to find out where the nearest emergency sanctuary or shelter is located. There are often shuttles who will pick up the homeless and take them to the location. Local police will also take them to a shelter. If you know people who need help and would like us to see what we can do please send an email. We will do our best. We hope you will as well. Before we get into the highlights of what has happened since our last update we want to make sure you have all registered for the Coming Together Hunger Conference. We are co-hosting with the Food Bank of Delaware and are SUPER excited about this year’s event! We are anticipating nearly 200 students to attend for the Kid Track, but we are hoping all of you will attend on the adult side. Don’t worry, even the adults will have a chance to see what the kids are doing throughout the day. Coming Together will feature both an adult track and kids’ track, with opportunities for both groups to come together to identify solutions to issues related to hunger. I promise you that you will leave feeling inspired and you will learn something. Plus I would like to see you out, because you know we can only end hunger if we do it together. Okay so what have we been up to since our last post. A LOT! You know we say that every time. Haha. There have been a few code purples called in Delaware. We thought our winter had been mild and really it has been but the last couple weeks of winter went out in style bringing us frigid temperatures snow and even an ice storm! It was beautiful, but it was also really bad news for my friends without addresses. We had a table at the 1st Annual Christina School District Family Resource Fair which was a big success. Many people came out to see what the community has to offer and we heard that the New Castle County library exhibit handed out over 100 new library cards to people! That is VERY COOL! I couldn’t be there for the event so my family helped out. My brother and sister, Finn and Amelia, they set up the table and they were happy to be able to support 3B. Plus they got to eat pretzels and have their face painted! I was able to be a speaker at the annual Delaware FFA Convention earlier this month. It was nice to see a room full of students who care about agriculture and who realize that food insecurity is a solvable problem. They packed almost 500 bags of healthy food for people in need. We brought some home and the rest remained in the Kent County area to help any shelters who might needs extra supplies. I found out that I am a recipient of a 2017 Sodexo Foundation – STOP Hunger Youth Grant! This makes me very happy because it helps to keep 3B sustainable, but it also helps to show other kids that there are organizations out there who believe in them and believe that we are change makers. The Sodexo Foundation and STOP Hunger are empowering, they not only want to help end hunger but they also want to get kids involved and I am glad I can be one of those champions. Last but definitely not least. I took a trip with my Mom up to New York to attend the Jefferson Awards Foundation annual gala at Gotham Hall. Yes, it sounds like something right out of Batman and yes I do think that is really cool. It was super fancy. There were a lot of incredible people there and all of them believe in public service, it was super inspiring to be a part of the event. I feel very honored that I was able to receive an activation award (Newark Post) on the same stage as Olympic Gold Medalist Laurie Hernandez and the great musician/social activist Harry Belafonte. Plus, I encourage all of you to look into the national LEAD360 winner for 2017! Her name is Emma Stumpf and she creates art kits to give to patients in children’s hospitals. She knows what it is like to be stuck in the walls of a hospital for long periods of time as she is fighting cancer and has been for many years. I didn’t get to meet her at the event because she was in the hospital having just come through her 17th brain surgery. She is definitely a huge inspiration! I hope you are willing to help her activate this project and help it to put smiles on the faces of kids across the country. I think it will be fun to help her with this project! Today is Martin Luther King, Jr. Day and so it only makes sense that it is also a National Day of Service. Martin Luther King, Jr. did so much every day of his life to help others reach equality. I’d like to think on a smaller level I’m trying to help people be more equal, too. I think we should all have equal access to healthy food. It shouldn’t matter how much money you make, you should be able to eat healthy and live healthy. So on this day of service my friends at the Jefferson Awards Foundation packed 58 bags which will be delivered to Friendship House’s Women’s Shelter on 7th & Orange Streets in Wilmington, Delaware. I’m very grateful to them, especially Michele Fidance who set it all up. MLK Service Day – Jefferson Awards staff and their kids packed 58 bags! So it was a day off of school but a day ON for service. 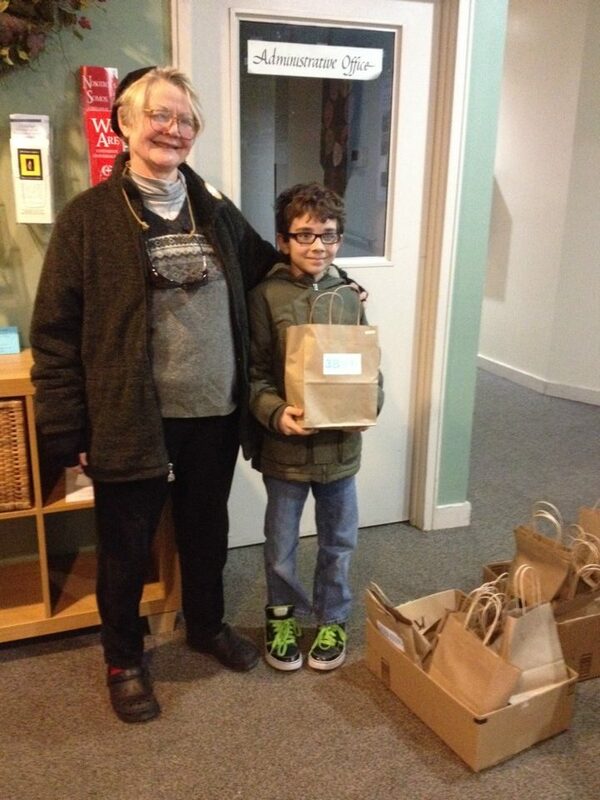 We’ve prepared 25 more bags for a code purple tonight hosted at St. Paul’s Lutheran Church. There was one last night, too, at Holy Family Church and my Mom delivered for me solo because I wasn’t home yet from my weekend with my dad. We’re almost a week into the New Year and things are already going well. We really have some of the best helpers and supporters. I hope all of you had a great holiday. We did. I got some new games for my computer that I really like and some new clothes. My Mom made some really yummy cookies, like a lot of chocolate chip cookies! And we got to see all our family even by Uncle Greg and Aunt Kristin came home from Texas and Michigan. On Christmas Eve my family and I brought our 3B bags to Calvary Baptist Church in Newark. They opened their doors for the night so homeless patrons could spend the night there if needed. When we got there to drop off our bags and a generous supply of handmade warm winter clothing we were amazed by all the donations they had from other community members. You guys are all so awesome! The temperatures have dropped now in January and two code purple nights were called so far. We were able to supply bags for the patrons who attended the code purples in Newark, Delaware. Along with the healthy snacks supplied we were also able to supply socks and handwarmers in every bag! We want to thank the Friendship House, the Newark United Methodist Church and the NewArk UCC and all of their selfless volunteers who were able to organize these nights when the temperatures dropped. Everyone across the nation can call 2-1-1 if they ever need support or information about where they can seek shelter. Please if you see someone on the street in need, especially when it’s freezing out, call 2-1-1 for them and see where they can go for help. My Gram has a daycare called Circle of Friends and the kids who go there are like family. Their parents were happy to have their kids participate in an act of kindness service morning by packing bags. Each child had their own special job. This is really cool because you can be 2 years old and make BIG differences in helping to feed the hungry. On December 31 a blog called Exceptional Delaware posted an article about me and Brae’s Brown Bags and named me “Exceptional Delaware’s 2015 Hero Of The Year.” The author, Mr. Kevin Ohlandt, said such great things about what we are doing. The article made my Mom AND my Gram cry. Happy tears. We have big things coming up this year. More 3B Ripple student chapters will be launching, more bag packing events, conferences, leadership events with the Boys & Girls Club and more. It’s going to be a great 2016 thanks to all of you! My mom told me this morning that if I didn’t wear layers and dress properly the cold weather would hurt my skin. Of course I didn’t believe her because when I went outside I wasn’t cold. But then she told me it was because I was dressed right. Moms! It’s really cold. Like, really, really cold. The app on my phone said it was 2 degrees but with the wind it felt like -18 degrees. We have been packing up 3B bags for the emergency shelters. I wish there was more I could do. I put hand warmers in the bags but that won’t help when it is this cold, at least not a lot. The Friendship House says, “Over the last two winters, the number of people seeking sanctuary on bitterly cold nights has dramatically grown and become more diverse.” You can donate to the Friendship House to help or you can volunteer. For a current list and donation drop off options call 302-652-8133 for the Friendship House. You can also donate to 3B, we’ve been running out of hand warmers and food and buying them multiple times each week. So a couple things to talk about. I don’t have school today because it is President’s Day but that doesn’t mean I won’t be busy. Last weekend, my Mom and me, we went to Atlanta, Georgia for the Kids Are Heroes Youth Leadership Summit. I had a good time. I met a lot of people. Even a boy from India. There were hundreds of kids there all doing cool things. Some of them are business type things, like this boy who has an ice cream cart and sells ice cream. A lot of the people I talked with all do things like help to fight against bullying or helping to raise money for malaria or cancer or down syndrome. Oh and Danielle Gletow who is a CNN Hero and she helps grant wishes to foster kids with her foundation called One Simple Wish. The airport lost my presentation. Luckily our hotel was near an Office Max. My Mom and me worked on creating a new tri-fold until 10pm the night before I was to present. I got green glitter everywhere. Really. I gave a talk during the summit and I think I did well. My Mom recorded some of it. You can watch or listen on my YouTube page. There are some pictures too at the bottom of this post. Then tonight I’m giving a presentation at the University of Delaware to the Kappa Omicron Nu Honor Society. My Mom has class so she won’t be there but she’ll be in the same building. I think I’ll do good though. I like the students at UD they are always really nice. We have a meeting with the Food Bank of Delaware on Wednesday about the upcoming regional hunger conference. We’re going to talk about the kid track. My friend Tanya Steel will be on the call. I am happy about that. My Mom and me met with people from the Food Bank on Thursday to talk a little bit more about the conference we’re all planning together. We have some more ideas on how to move forward and who to to invite. I would really like to invite Mario Batali and Gabby Douglas. I’m also going to work on creating a video invitation to send to the Kid President. I’ll let you know when I get it put together. Then on Friday we met with Richard Rind, Director of Auxiliary Services at the University of Delaware and Sue Bogan who is the Director of Dining Services. My friend Jessica Stump joined us and so did Senator Bethany Hall-Long. We were meeting again to talk about how the University of Delaware should try and recover some food around campus to give to people in need. It isn’t really the dining halls, it’s the other food locations like Einstein Bagels or Starbucks who might have leftover food at the end of the day which, if not recovered, would be wasted. I’m hoping we can get the food to places who will be able to use it. It sounds like UD will be willing to work with me and my Mom, but we need a place to accept the food on a regular basis, and that seems to be the problem right now. Ooooo and Fusion Fitness in Newark, DE is doing a fundraiser for Brae’s Brown Bags. I’m so happy they want to help out and also encourage people to not only be change makers in life but also to live healthy! They have held fundraisers for several different community organizations. Thank you Fusion Fitness! And it has been SO COLD here in Delaware. I think it was 18 degrees this morning when we woke up for school and that wasn’t with the wind chill. There have been 15 or 16 code purples which means the nights are below 20 degrees. Really nice people volunteer to host sanctuary at their churches to allow people to come in out of the cold. I have been trying to get my 3B bags to these hosting sites as often as I can. It’s hard though sometimes I don’t have bags packed in time. I hope people like them when they get them and that they are helpful. Which reminds me, I need to tell my Mom we’re out of hand warmers. Again. Wilmington, DE and Newark, DE have had code purple systems in place for years thanks to the Friendship House. Churches and a bunch of volunteers open sanctuary to the homeless to get off the street when temperatures drop below 20 degrees which has been happening all week in Delaware. Kent County began establishing this system for the season this year and I’m happy to hear that people in need have a place to go. For Code Purple Sanctuary locations in Kent County call 1-800-733-6816. Today is a high of 20 degrees even in the daytime, right now as I’m typing this is is 9 degrees. The windchill is negative! This week my family and me have packed up about 100 bags already to give out to the sanctuary locations. Last night my neighbors Barb and Sammy Lawson came over to help. Today my Mom will be bringing 25 bags and warm clothing to Calvary Baptist Church in Newark, DE on East Main Street because they are the code purple location today. My Mom has been bringing bags to locations this week during her lunch break since I’m in school. The Newark Empowerment Center opens from 1pm to 4pm also to serve lunch to those in need. I also have a flier of emergency shelters for Delaware and you can download it here. If you are able to help people in need please take the time. Offer a hand to them, offer a smile, offer a 3B bag or pack up your very own. If you have extra winter weather clothing, put it in the car with you and if you see someone on the street you can give them the clothing and also let them know where they can go to seek sanctuary. Yesterday the temperatures were well below freezing here in Delaware again. Newark, DE opened up a Church as a sanctuary to the homeless so they could come inside out of the cold. Yesterday the host was the Unitarian Universalist Fellowship. They offered me and my brother some hot chocolate after we delivered the bags. They asked me about how I started 3B and I told them about my trip over the summer. How I went to the White House and met Michelle Obama and shook hands with the President, Barack Obama. They took my picture to put on their website and also said I am welcome back anytime. Tonight is another sanctuary night due to the cold and the host will be First Presbyterian (292 W. Main Street, Newark, DE). The door will open at 6 p.m. People in need should be encouraged to pre-register at the Empowerment Center open from 1 – 4 p.m. both days.